RISING is a collection of artistic and oral history accounts that reflect how the North Carolina coastal region has changed over time. This traveling exhibition displays these generational stories throughout the state to help all North Carolinians better adapt for a more resilient future. 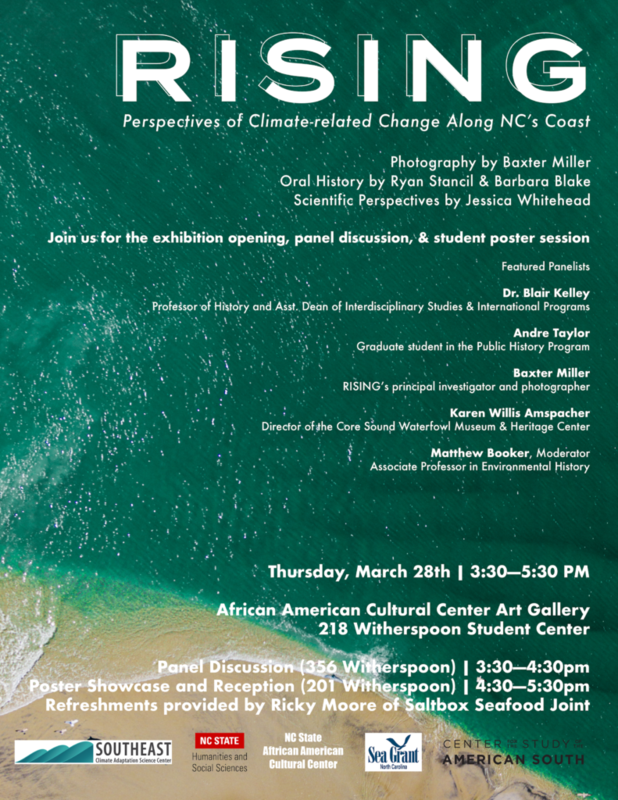 We are thrilled to be a partnering in presenting the RISING Exhibit at NC State University. Please join us for a compelling event that includes panel discussion, a student poster showcase, reception and exhibit viewing. Karen Amspacher: Director of the Core Sound Waterfowl Museum & Heritage Center and co-author of Living at the Water’s Edge. RSVP here for the grand opening event on March 28! The Panel Discussion, part of the Global Change Seminar Series, will be streamed for remote participation. Click here to join the live stream.